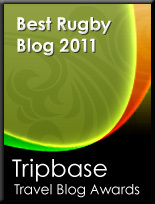 I was humbled to learn that I have been rewarded for writing a load of guff about rugby by the receipt of a Tripbase 2011 Blog Award. Who or what Tripbase might be is anyone's guess, but I would nevertheless like to thank the Academy, my wonderful agent, my lovely wife, my adorable children, the Great Blogger in the Sky and anyone and everyone who knows me. Most of all I would like to thank you, my adoring public, without whom none of this would be possible. The award comes with a cheque for £50,000. So do you have a spot in the living room or on the mantle picked out for this award? Great stuff, and congratulations! I have also received my 50,000£ cheque together the 24 ct golden trophy... You're welcome in Paris for a beer to celebrate, as well as Steve/Nursedude and all Flanker's friends ! Congratulations! Only you and RugbyDump in it from my perspective and new creative content beats videos any day in my book. I'm awed at the discerning judges. Probably the 57 olde farts. Nevertheless, when I read your site I am always humbled. I am awed by the creative nature and benign nature of your stories. All 57 olde farts are in agreement. Well done. I am humbled by your success. It's true. Great stuff.